The continuing battle between Ibiza residents and tourists has taken a further twist with the forming of “Prou!”, a new pressure group that wants to combat the “abuses of tourism” that many feel are occurring on the island. 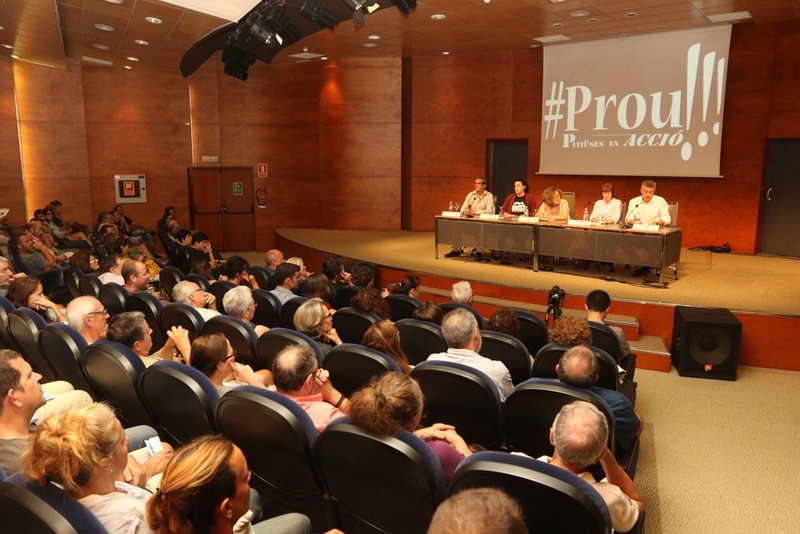 Prou held it’s first public meeting last week at the ‘Club Diario de Ibiza’ filling the auditorium and exceeding its 200 capacity, a sign of the growing discontent of the direction the island is going. The group announced that it will hold “peaceful and silent” protests against harmful or illegal tourism activities when institutional action does not work. To do this the group has “a hundred people to perform these actions,” explained Sandra Serra. Historian and teacher Neus Escandell opened the meeting by saying that “tourism must serve to improve the quality of life, not to make it worse.” Highlighting the importance of the industry to the economy of the island but saying that “the culprits are not tourists but businessmen and politicians who have allowed us to reach the current situation,” characterised by the “privatisation” of the the beaches, noise pollution and illegalities of some companies. Lawyer Rosa Redolat said it would be sufficient if existing laws were enforced. “There is a general feeling of passivity and neglect. Had laws been enforced from the outset we would not have come this far”. 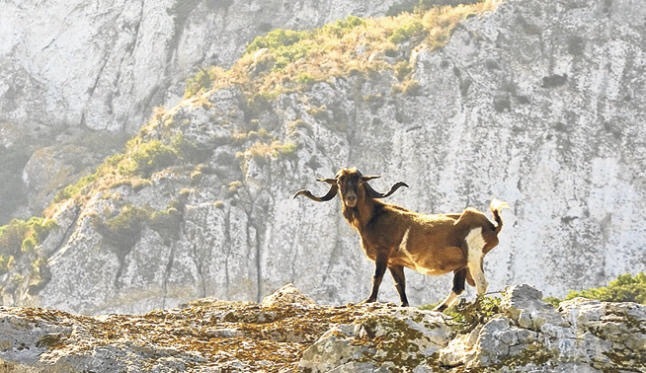 Redolat said whilst accusing politicians of “passing the buck to each other” citing a lack of coordination with the posidonia* situation or the large mansion given the go ahead to be built on protected land near Cala d’Hort. 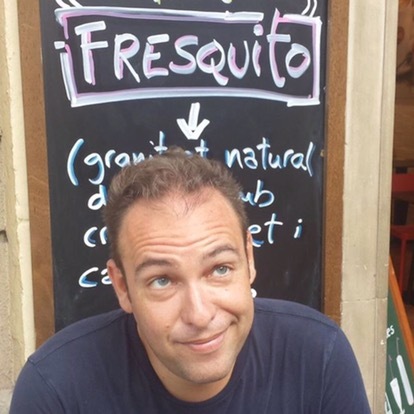 School teacher Agustin Garcia further explained “the word collapse is on everyone’s lips, Ibiza is in danger of becoming a theme park due to lack of control, tourism must have limits, as a matter of survival”. Prou reinforced this by inviting a child to explain that on the night of Space Closing the music was so loud that inside his bedroom it felt like he was in the nightclub. Prou! has promised regular meetings and is preparing a strategy for the coming months and summer 2017. *Posidonia oceanica (commonly known as Neptune Grass or Mediterranean tapeweed) is a seagrass species that is endemic to the Mediterranean Sea. It forms large underwater meadows that are an important part of the ecosystem. 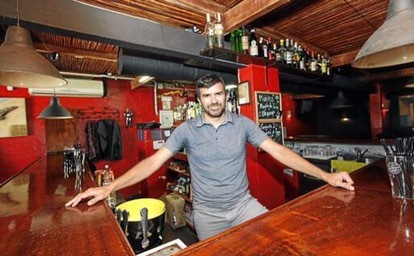 Pep Colomar, the President of San Antonio’s West End Association has spent half his life working in one the town’s and Ibiza’s most famous and busiest streets, firstly helping with the family business then taking the reins of the popular Bar Colon. Now 37 years old, he has witnessed the evolution of San Antonio and remembers a different West End: “For years Germans, Dutch, Scandinavians came … it was very different from now.” Colomar is convinced that the return to that type tourism is possible, “it only takes the will of the people and the town hall to enforce the law”. Here in an interview with Ibiza daily paper El Periodico he gives his views on the summer season so far. Q: As we come into the peak season, from your experience, how do you think it’s going? A: The Season is more or less like last year. This year started earlier and we had a pretty good May and June like last year but unfortunately we still have the same problems as every year: PR’s, illegal street sellers, prostitution, crime and theft. Q: Last year the change of government occurred during the season but I understand that there are things that haven’t changed? A: This winter, like every year, we talked with the Town Hall to plan the season. The Illegal PR situation had become a problem, each bar and club were allowed to have a specific number of legal PR’s in certain areas but unfortunately the old rules weren’t followed and the news rules have just aggravated the problem. A: The old rules weren’t followed and the numbers were exceeded. The Town Hall said it was difficult to distinguish legal PR’s from illegal PR’s (even though the legal ones wore reflective vests) and said it was difficult to enforce the law. On this basis the Town Hall decided to completely ban ‘dynamic publicity’. We agreed as long as it was enforced. Now can see that it isn’t being enforced and the unfair competition is brutal. Those who fail to comply with the law have grown and become strong and it has been a huge disadvantage for those who do not have people outside their bars trying to attract customers inside. Many are falling into despair and desperation because no correct measures are taken or being enforced. Q: What does the Town Hall say? A: We have talked with them 3 times since May and their consistent answer is that they are acting to enforce the law but they aren’t doing enough. This failure is causing us many difficulties and problems within the West End Association. There are people who are already saying that they can’t follow the law because their neighbours are ignoring it and they are suffering, it’s a very serious problem. They feel helpless because their neighbours have PR’s, loud music, open doors yet are calm because nothing happens, no police and no formal complaints. Q: The problem lies in the failure to enforce the law? A: Yes. If you have a law then you must enforce it. The laws have been passed but it is very difficult to monitor compliance if there are no police officers. We need more police in all areas and is absurd to not have enough. If there are no police on the street it is useless to have a law that penalises bars, the Town Hall should prioritise and tackle the most serious problems first. We have asked that if they can’t enforce the law then at least they should allow dynamic publicity again. Last year we hired private security guards but were told they weren’t allowed to do the work of the police so we asked the Town Hall, as an emergency measure, to let them accompany police officers but they said no. Q: Is it increasingly urgent to change the San Antonio tourism model? A: Yes, it’s urgent. The process needs to start so we can fix the things that are wrong. That’s not to say I just want nice families to come to San Antonio and nothing else because you can’t change overnight. If there are still these problems of public order, drugs, prostitution, crime then the model cannot change. First you have to fix all that and then the model will change automatically. It’s absurd to go to a trade fair to sell a San Antonio that does not exist. We must fix the problems first and them the model will change. Q: How do you make the change? A: The model change should be encouraged by both sides. The Town Hall enforcing the rules and entrepreneurs working differently, offering a higher quality product. The problem is that if the Town Hall doesn’t do enough then there are many bar owners who out of greed or whatever will continue to work illegally because it’s easier and more profitable but this shouldnt be the case. We are complementary offer. For us, if there is a change in the tourism model them it should be relatively simple to adapt to our business. This year there are 4 bars fully reformed in Calle Santa Agnès. But again, the priority is to end the unfair competition. It all starts with the rules. If you make laws then don’t enforce them you create 2 problems. Q: So the ball is back in the Town Hall’s court? A: Aida Alcaraz (Councillor for the Interior) tells us that they are making policing arrangements, but the reality is that the same problems are still here. It’s not enough and the situation has got worse. There is good dialogue with the Town Hall but this in itself is not enough, specific actions are required. I understand that we demand a lot but this is because they do little. Always they argue that their hands are tied by the law but as entrepreneurs we must demand certain things as we pay taxes and they have created rules that have not been met and have in fact had a perverse effect. If you create rules and can’t enforce them then that is making the situation worse as well as committing an injustice. They must be realistic about the strength of the local police, they say there are more agents than ever in San Antonio but the reality is that there are clearly insufficient. In addition agents do jobs that aren’t theirs, they are overwhelmed. Q: Despite all these obstacles, it is possible to change San Antonio? A: I think so. Everyone in San Antonio wants better and if everyone pushes in the same direction then the model change is possible. We agree with the rules but when you do not know how to enforce the remedy then it becomes worse than the disease. We understand that the police are overwhelmed but employers also also overwhelmed with a sense of desperation that the rules are not being enforced and some people do exactly what they want. They say complaints for non-compliance will be processed faster but nothing has changed. The situation has reached a point that is unsustainable and changing the tourism model is urgent. 1. Let us accept that music in Ibiza is important but need not be in every corner of the island at every time of day. Please, a little silence is not a bad thing. 2. What the sea leaves us on our beaches is not dirt but aquatic plants and algae that are necessary for the sea to remain so wonderful. What is dirt is what we throw into the water that does not belong to any marine ecosystem. 3. Any corner of any road is not a car park. As much as we pretend there will come a time when no more cars will fit on the island. At least park in a suitable place even if you have to walk a little. A stroll on our coastline and through our countryside is very agreeable, good for photos and great for your heart. 4. On our island live people with very different schedules to those on holiday. They lead normal lives, they work then they sleep. If you walk through the streets screaming at night they have every right to be upset at your behaviour. 5. Our streets are not beaches, please put some clothes on to walk around the town centre, not just a bikini or swimsuit. Agreed, there are some bodies that deserve to be shown but reserve that pleasure for the areas more suitable. 6. We are a civilized island with rubbish bins and containers. No need to throw litter everywhere, it doesn’t cost anything to put it in the right places. The area around the containers is called a street not a compost heap. 7. As much as the national and international press seek to convince otherwise, Ibiza is not a drug vending machine. Here is the same as anywhere else with tourism and nightlife. Nobody forces you to consume anything you shouldn’t, do not use the island to justify your actions as that is the cheapest excuse. 8. The Island was here long before the clubs and they weren’t the first attractions either. The world doesn’t end when the clubs close its not a disaster of there’s no ‘carry on’. If you take off your sunglasses and stay a little sober you may find that you are in one of the most beautiful places in the world. 9. We are an island surrounded by salt water, around and below. Wasting drinking water hurts us ibicencos (or should). Be aware of this problem, especially those who come from a place where it rains 1000 times a year and have very large rivers. 10 Try to enjoy local food and centuries-old authentic Ibizan culture. The people of this island are warm and friendly and will make you feel at home. Although if you come only to drink your own drink, eat your own food, speak your own language, watch your football games and listen to your music without leaving your hotel pool …. you probably didn’t need to travel so far. The standoff between Amnesia & San Antonio Council has taken another turn with the announcement that the SuperClub has changed its hours for its widely anticipated opening party. This is part of an ongoing row which has seen the club continually flout the law by closing late and then paying the ensuing fines. 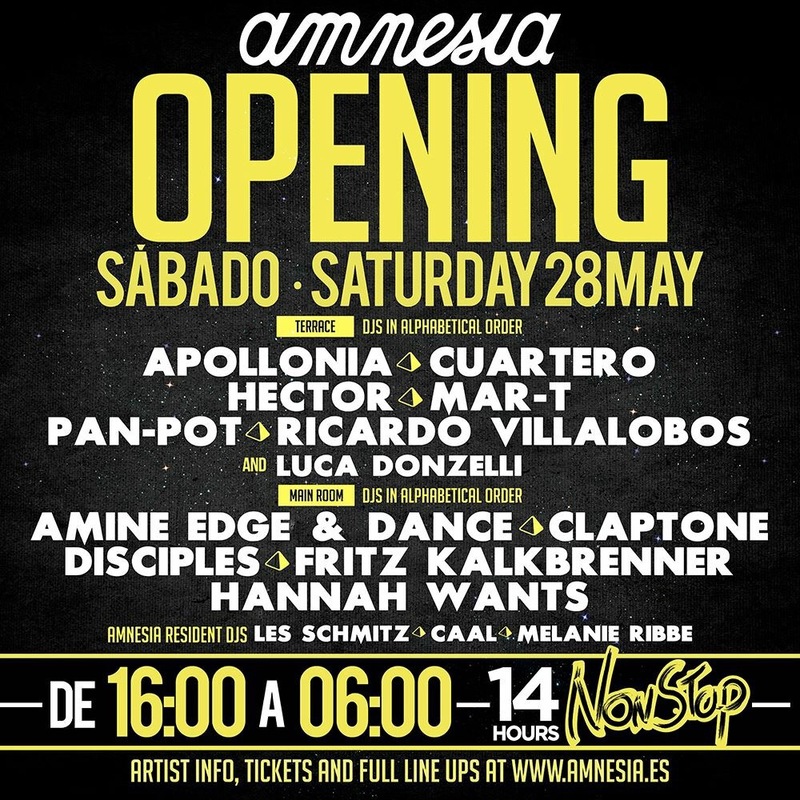 Amnesia has had 31 sanctions over the last 2 years paying fines totalling 102,000 euros leading to San Antonio Town Hall’s decision to refuse the extended hours application for its owning party. 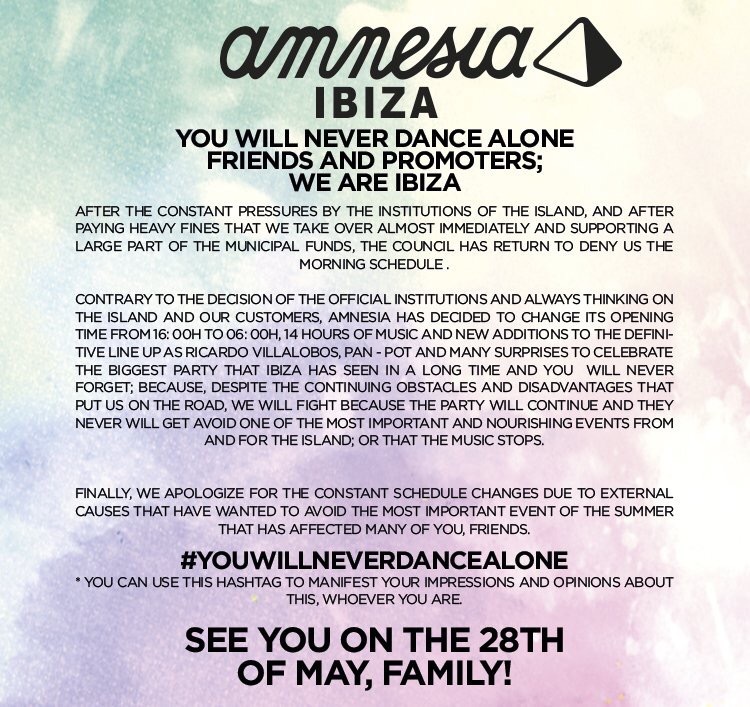 Opening at 4pm is a surprising turn of events but Amnesia was left with no other option under current legislation if it wanted to extend its hours. Mirroring Space’s opening hours model is a risky strategy especially as other opening parties are on the same day however Amnesia has consistently delivered the goods and is rated by many as the best SuperClub opening on the White Isle. The Ibiza Island Council has confirmed that they are gearing up for a big crackdown on the illegal supply of tourist holiday homes. With the help of a specialist computer program the Ibiza government say they will be able to keep track of all properties being advertised for rental on the internet and detect the ones that are doing so without a licence and therefore illegally. The new software comes at a cost 3,000 euros and has been provided by a specialised company. “It is a perfect tool that has been created by people who know a lot in the matter,” said Vicent Torres ‘Benet’ the Island’s Director of Tourism. The Ibiza government and other pressure groups blame the proliferation of illegal holiday homes for the alarming lack of annual rental accommodation available to residents. 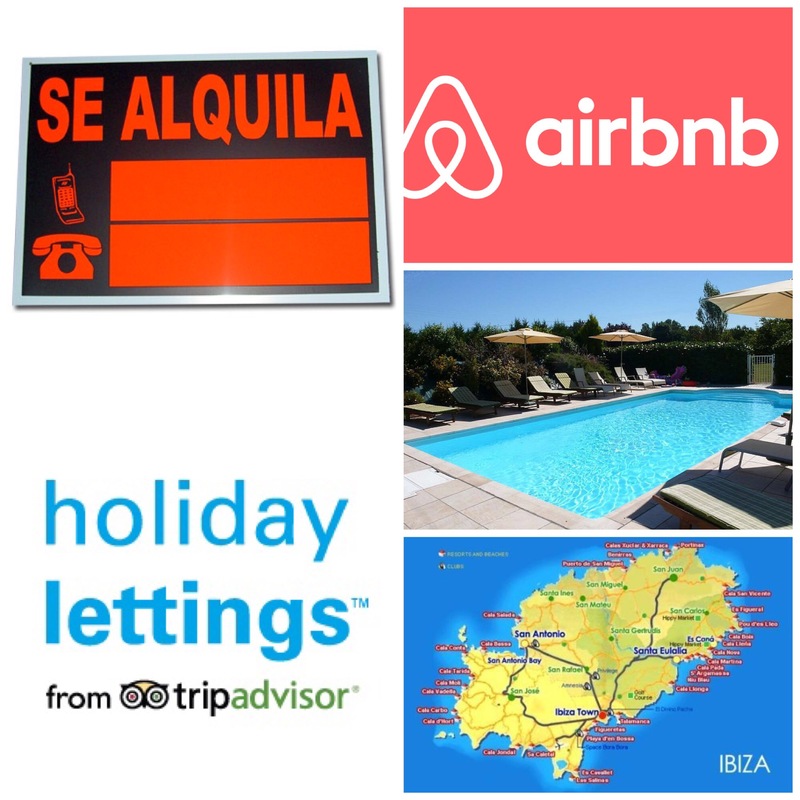 Rental platforms such as Airbnb and Holiday Lettings have given Ibiza home owners the opportunity to ‘cash in’ during the peak summer months however this has caused the demand for long term accommodation to reach unprecedented levels. The homeless charity Caritas has also weighed into the debate calling for urgent action citing that some workers with contracts are being forced to pay 500 euros per month to sleep on a balcony. The island government say that the computer software will become effective ‘in the next 10 days’ to begin sweeping the net in search of properties being offered illegally for holiday rental. According to Torres, the application will be “very important” to combat the problem. “This program provides so much information that the Tourism Inspectors can now open an investigation without visiting the site which was previously required”. Those found to be illegally renting their properties face fines from 4,000 to 40,000 euros, depending on the severity of the offence. Legal tourist holiday homes must meet a series of requirements including a certain number of bathrooms as well as other health and safety features. Representatives of the Balearic Villa Associations have come to an agreement in principal with the tax authorities on how to collect and pay the the new tourist ‘ECOTAX’ that’s due to be imposed this coming summer. The tax will be calculated using a ‘modules system’ that takes into account the sleeping capacity of the villa plus the dates it is occupied. This does not apply to private apartments as under current legislation it is prohibited for them to be rented out to tourists. 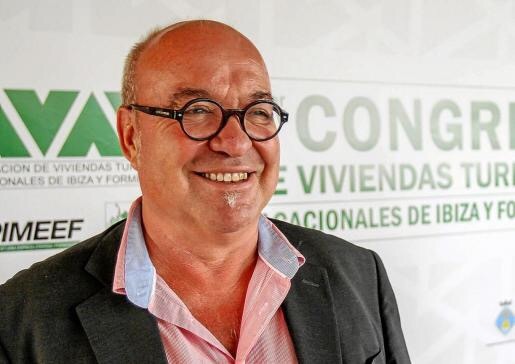 Roberto San Esteban, President of AVAT (the Ibiza and Formentera Villa Association) said that this is the “least worst” way for owners to collect and pay the tax but regrets that many villas are already booked for the coming summer forcing his members to “pay more”. The payment formula will be introduced at the same time as the new law is implemented and instead of paying the usual €1 + IVA per person per night the villa owners and operators will pay according to the size of the property and number of bedrooms/beds. San Esteban went on to say that many villas are in the process of legalization so as yet “there is no control” over them. It’s also been agreed that because each of the Balearic Islands has different occupation months this will be taken into account using a ‘correction factor’. San Esteban commented that holiday homes in Mallorca have a 6 month period of occupation while Ibiza only has three and a half months and Menorca and Formentera even less. “We discussed this correction factor and reached a consensus. Now we just need the approval of Viviana de Sans” said the representative of AVAT, which has 212 members even though the official number villas registered or being registered in Ibiza stands at 1,900. The tax payment will take place between May and June of the following year of activity; i.e. owners/operators will pay the ECOTAX for summer 2016 in 2017. As the first year is “difficult to assess”, from January next year, interested parties may change to a module that better suits depending on the activity recorded in the previous summer but San Esteban warns that the Tax Agency has control mechanisms in place to ensure that villa owners/operators do not try to avoid paying part of the tax with a module that isn’t representative of the actual occupation. “Just by looking at electricity and water bills you can see the use (and occupation) of the property”. It was also agreed at the meeting that a Balearic ‘holiday home’ census would be created for the first time using all available data from the tax agency and the Balearic Ministry of Tourism. San Esteban welcomed the special inspections recently announced by Viviana de Sans for this coming summer to root out unfair competition and expected them to be “intense”. The President of AVAT remarked that there are unscrupulous operators who come to the island for August armed with just a website and a mobile phone who don’t pay any taxes and deceive clients who are left stranded without any liability insurance”.